Siviglia online ES · Petizioni - salva la natura incontaminata della costruzione massiva. 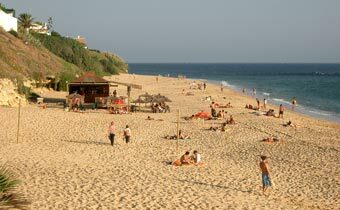 August 2012, SevillaOnline has started to gather and include references and links to petitions that are aimed to save the last few unspoiled natural environments from mindless speculation and mass-construction, most specifically and recently: beaches. We will gradually add and accumulate existing and new petitions to try and help avoid unspoiled nature go extinct, starting in, but not limiting to, Andalusia. However, disposing of little time and manpower, we can only try to keep up as good as possible. This information is already massively distributed in Spain, but @SevillaOnline we think that signatures of foreigners (possible future tourists) will have extra impact on the local authorities, so, please, do sign if you want to help save unspoiled nature in Andalusia, or, for that matter, unspoiled nature in general. The construction of this mega-hotel of 411 rooms in this protected natural surrounding was declared illegal in 2008 and should have already been demolished. This hotel was illegally constructed in the 60ies on the beach of Zahara de los Atunes and hast never been opened to the public. It was considered to be the main symbol of the fraudulent innovation of public property and it's demolition one of the mayor examples of the government's intention to abandon obsolete and aggressive construction politics in favor of sustainable development of tourism, respectful of the natural environment and quality of the beaches. On this idyllic spot there used to be a Club Med, very popular in the sixties and seventies, but abandoned since 2003. It was bought by the government and invested 7 years and over 10 million Euro to bring this exceptional environment back to it's original state. Fotografie della provincia Malaga, Spagna.